Inflight — Urgency or Emergency? Topic: Inflight Urgency or Emergency? Long time CFI and all around good guy, Mr. Irwin Fust will discuss… do you declare an emergency or? Don’t forget that tomorrow, Wednesday the 19th, is our monthly meeting. Most likely, it’ll be a short meeting, starting at 7pm, but come early if you wish to join us for dinner… due to the weather, it’ll most likely be pizza! This month’s meeting will again be at Tony’s hangar, facing the runway. Also, don’t forget cash or check to reserve your seat(s) at next month’s Christmas Dinner! Look up Ken, Stan or Jack to get your tickets. They have tickets and sign up sheet to make your entree choice. A huge congratulations goes to the airport operators for getting the antiquated 100LL Self Serve fuel pump operational in near record time! Thanks to their efforts, the fuel discount for Display Day weekend will be offered. Look for $4.79/gallon self-serve 100LL from Friday evening through Monday morning. Dues are due. Single is $20, Family is $25. 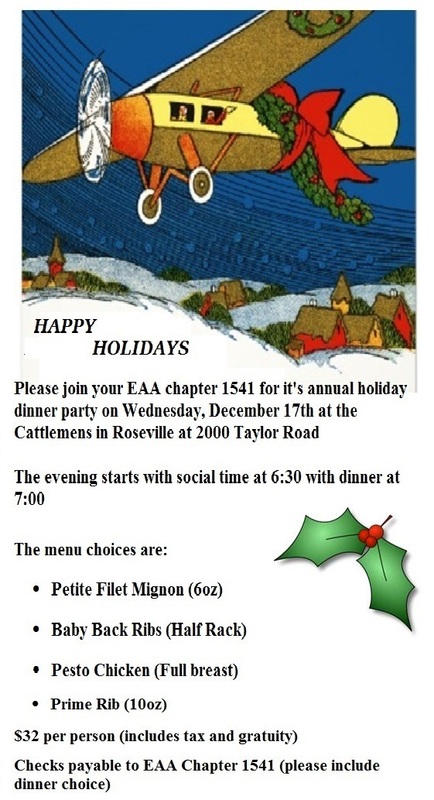 You can bring cash or check to the next general meeting, or mail a check (EAA Chapter 1541, PO Box 906, Lincoln, CA 95648), or make payment by a credit card or PayPal. Our next meeting will be November 19, at Tony’s Hangar, E-5, 19:00. There will be dinner at 18:00. If the nice weather continues, we’ll squeeze in one last BBQ, if not, you just never know what we might have. Topics will be the website and the upcoming Christmas Holiday Dinner Party Meeting. Speaking of the Holiday Dinner Party…You can contact Larry Bontrager (916) 209-8386, landguy@hotmail.com, for info or reservations. $32 per person. Speaking of annuals, the Pietenpol is down for its annual, but that’s not important right now. But what is important is that our President (Richard, not that other guy), has a very exciting, surprise announcement to make at the membership meeting. It looks like the 100LL self-serve pump at KLHM went down. The pump that runs the self-serve fuel station and allows the top filling of the AVGAS truck is broken. There’s about 300 gallons in the truck to work with while the service tech troubleshoots the problem. They’re working on an alternative solution to fill the AVGAS truck so they can fuel aircraft during business hours. Rich and Tony are working on a possible schedule to be out this weekend for a few hours if needed. They apologise for the inconvenience. Bruce Estes is updating the membership roster. If you haven’t already, you may soon be seeing an email from him – simply reply with a contact phone number. We hope to attach a phone number to each email to give us a duplicate method of contacting all members. Of course, if you want in on the web roster, fill in the questionnaire. Remember to register for the holiday dinner party!